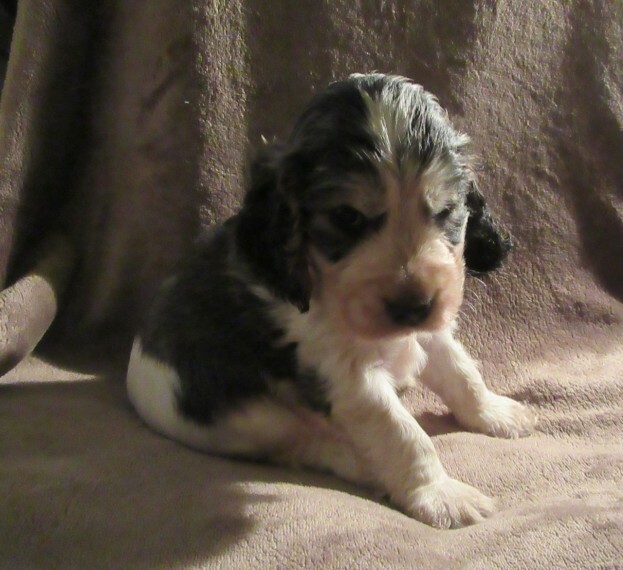 Stunning mixed litter of KC registered show type cocker spaniel puppies. These special puppies have been raised in my family home. their Mum is our beautiful loving sable roan family pet Issie who has been a fantastic first time mummy throughout. Daddy was a beautiful health tested sable stud of very similar size and type to Mummy from up North. They have been wormed at 2 . 4 weeks and will continue to be fortnightly. handled daily. Weaning is currently in full swing and all are doing well. They will be ready to leave us on the 11th of May at 10 weeks as from research they do better socially to have the extra time with their litter mates . Mummy this is also to allow them to have both courses of their vaccinations .as there are many different types it makes sense to me to have both done before they leave. so that they won..t need to be restarted and have delays to being able to go out and about with their new owners. They will also be chipped and vet checked. I am doing everything I can to prepare them for life with their new owners they will be familiar with bathing including hairdryers .my girl still isn..t keen so I thought it would be helpful with future bathing and grooming to get them used to it now. as they are in our home they will be familiar with usual household sounds washing machine. vacuum ect. If you tell me what you plan to call your pup I will use that and start getting them used to it. They will leave me . Fully vaccinated Micro chipped KC registered Up to date with worming With 5 weeks free insurance They are even already begining to toilet on newspaper which I will continue to encourage . clever puppies. and with a comprehensive puppy pack to include . .Small crate .if you intend to crate train they will eventually need a larger one but this will get you started their Mummy continues to use this size for the car. .Vetbed fleece cut to fit crate with mummies.brothers.sisters scent giving them a safe familiar place to aid them settling with you. . a toy from the collection they will be familiar with .3KG of the dried kibble they are weaned onto .15 trays of Naturediet meat which they are also weaned onto .Bottle of Drontal suspension puppy wormer so you can continue with their treatment. .Treat ball and pack of puppy treats .A little book containing some photos from their first 10 weeks. notes and weights .All their paperwork I am devoting months to give these babies a wonderful happy start to life I am going to be a little heartbroken to let them go. if you are interested in one of them please when you reply could you tell me a little about yourselves and what you are looking for in a dog as it is important to me that they find the right homes. As cockers these will be active dogs and do thrive with a good walk each day. they also love company so won..t enjoy lots of time home alone. They are wonderful loving family pets and these pups have been handled daily by my 10 year old daughter and visiting friends children so they will be well socialised. Looking for fantastic loving forever homes are the following . Sable Roan boy . Sable boy . Sable Roan girl . RESERVED Lemon Roan boy . RESERVED Chocolate Sable boy . TEMP RESERVED Black Sable boy . Blue Roan Sable girl . RESERVED Chocolate Sable boy .white mark on back of neck and paler face and legs than brother but darker in the body than his brother. . TEMP RESERVED Puppies will be endorsed this can be lifted with discussion. Thank you for looking this far if I have forgotten anything please feel free to ask. I will be asking for a 350 deposit to reserve the puppy of your choice following viewing the pups with Mum with the balance on collection.happy to hold on to them until you are ready for them if needed. the deposit will be non refundable unless I cancel for any reason in which case I will refund. Best to email at the moment as the little darlings are keeping me busy so I keep missing the phone.